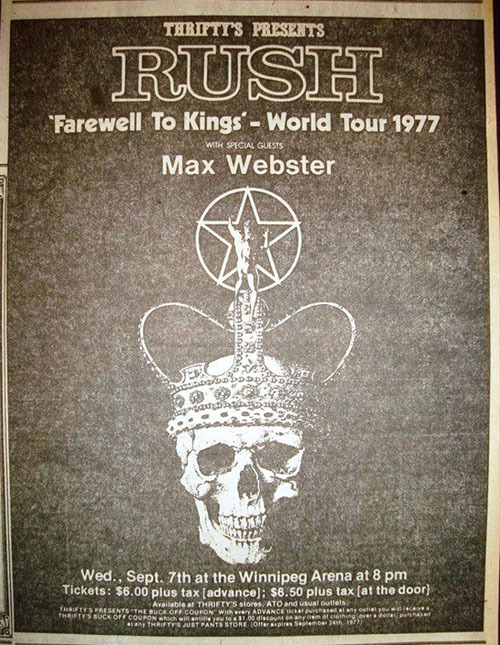 Max Webster and Rush, Rush and Max Webster. Whichever way you look at it, it was the all-Canadian show. As is the case with most Canadian productions, it was a definite steal from somewhere else — a little from England and a little from south of the border. Another aspect which gave it definitive Canadianism is that the underdog, in this case Max Webster, came out ahead before a crowd of 5,500 in the Winnipeg Arena. 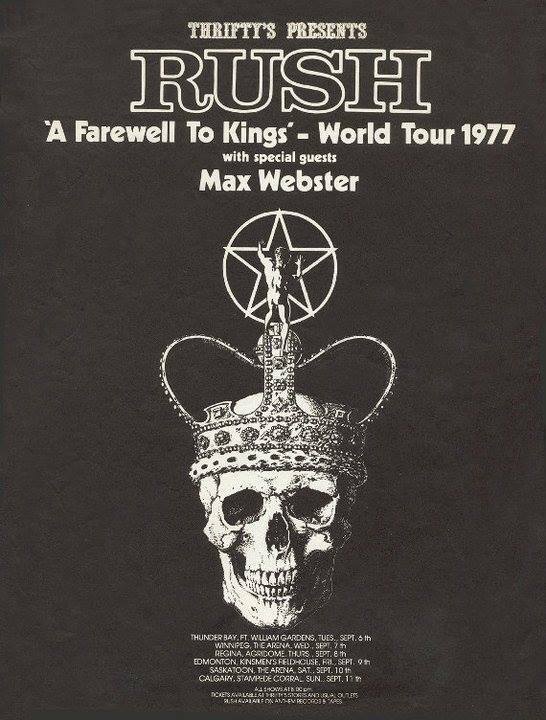 Wednesday night's concert had lights, explosions, posturing and stage flash, all the ingredients which turned lots of bands into stars earlier in this decade; Rush is counting on the formula to make them winners in 1977. The approach is commendable, but it's not likely to win them any fans who are over 18. For any concert-goer of the late 60's and early 70's, watching Rush is like having time stand still. 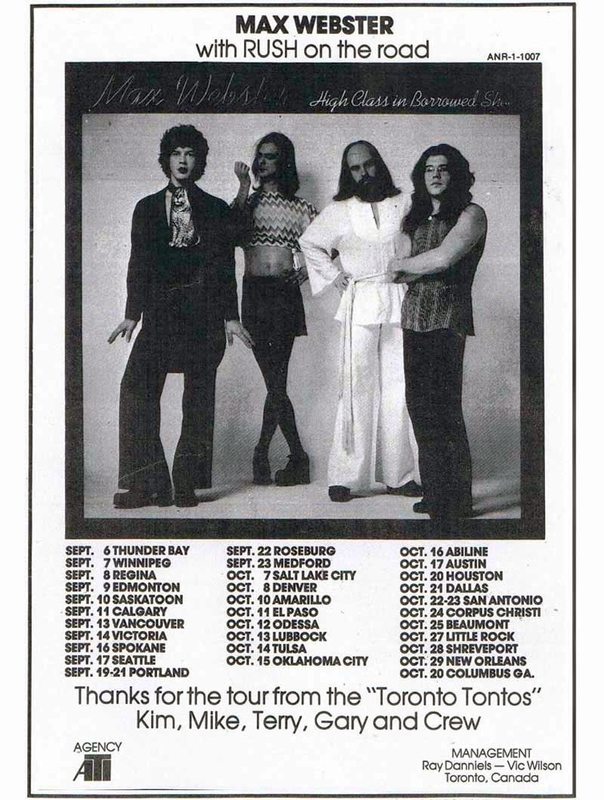 It may be unfair to compare the Toronto musicians to the likes of Led Zeppelin, and then only unfair to the English band, but as energetic as the trio appears to be, the style lacks originality. The dazzling guitar work has been done before; the oriental-style robes went out of vogue with the rockers about two years ago — Todd Rundgren being an exception; and the spacey music has been presented better by the likes of Yes and Pink Floyd. That leaves Rush with nothing more than hollow posturing, making the musicians imitators, and boring ones at that. What the band took 90 minutes to express could be wrapped up into the first 10 minutes of the show, from which point everything was either an imitation or at best a slight variation of what played before. The songs seemed drawn out, and as a result the audience couldn't follow them to their natural conclusion. The instrumental hardware was most impressive. Lead vocalist Geddy Lee now plays synthesizer, a double-neck guitar and bass pedals; guitarist Alex Lifeson keeps his fingers busy on a double-neck guitar, and his feed on a series of pedals; Neil Peart has added keyboard percussion to his armory of drums, bells, triangles, and anything else capable of producing a sound. Of the three, only Peart sparked the audience during a brief drum solo in the final moments of the encore. Max Webster came across with a little more musical depth, as the zany Toronto quartet romped through a 45-minute set culled mainly from its High Class in Borrowed Shoes album. 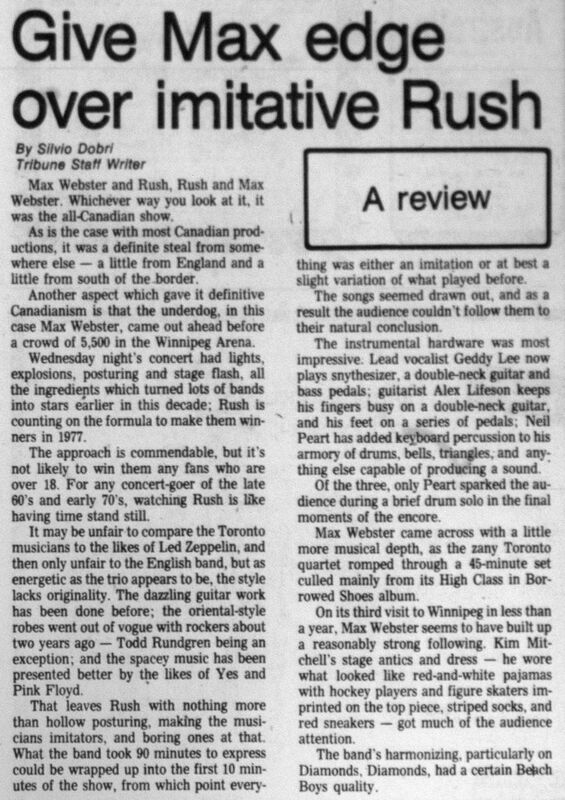 On its third visit to Winnipeg in less than a year, Max Webster seems to have built up a reasonably strong following. Kim Mitchell's stage antics and dress — he wore what looked like red-and-white pajamas with hockey players and figure skaters imprinted on the top piece, striped socks, and red sneakers — got much of the audience attention. The band's harmonizing, particularly on Diamonds, Diamonds, had a certain Beach Boys quality. 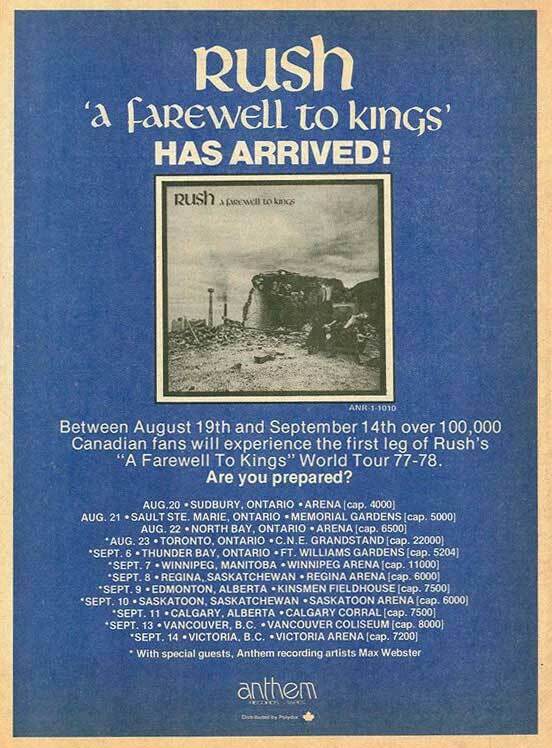 The Canadian rock group Rush laid down a super show for about 4,000 responsive fans Wednesday night in the Winnipeg Arena. Yup, they're really that good. The arena has all the charm of a cattle pen and can inhibit most musical groups, completely obliterating the easily intimidated. Rush is just too capable and overcame atrocious acoustics and poor visual angles with ease. And talent. The pre-show atmosphere was notably relaxed. This was a crowd looking for fun, not hassles, and it played the scene strictly for laughs. A half dozen frisbees zipper hither and yon and seldom touched down. An interesting historical note was the symbolism inherent in a picture of the queen next to the sign which read Thanks To You It Works. Massed banks of sound equipment glowered like prehistoric monsters gathered by some crustacean clearning. Max Webster, the opening group, started on the dot of eight, a welcome but most unusual feat. Despire the extra possibilities provided by keyboards and synthesizer, the total sound was ill-defined. The vocals were routinely unintelligible as well. Credit is due [to] the group for an attempt at contrasting material. Diamonds, Diamonds was pleasant and might have impressed more given better surroundings. Interspersed among the long-line, constant whine guitar chases were two other possibly interesting ballads. But it was just too difficult to separate the good sounds from the blurred pastiche. I had thought that fonsy hats went out with Shep Fields and his Rippling Rhythm. I was wrong. Max Webster tried it on, you should pardon the expression. There must have been a reason. Like so many struggling rock groups M.W. seems to feel it has to go all out, all the time. You don't build to a climax, fellows, unless you start a little lower down the scale and work up. On balance, not bad. And their 45-minute set was well received. But the big momeny arrived and the crowd roared throughout a dramatic, mysterious introduction to Rush. And it was a rush. This is one of the finest rock groups to perform here in some time. Though its members profess to prefer the term "progressive rock" to the erstwhile tag "heavy metal," it comes out tight, together, and — wonder of wonders — imaginative. Descendants of Cream, Hendrix and in two sets and modified Jeff Beck, Rush swings from Note One. It demonstrates precision and a sense of pace that's an absolute groove. Geddy Lee on electric bass, double neck guitar and synthesizer is also the lead vocalist. He has a high voice which I found initially disquieting but grew to accept. It fits the total texture of the trio and is employed accurately and musically. Lead guitarist Alex Lifeson is extremely effective while remaining less obtrusive than most leads. But my enthusiastic approbation must be reserved for the drummer, Neil Peart. Wild as it may seem, people here is a rock drummer with both technique and taste. While laying down a bedrock solid beat he never loses sign of the dynamic balance essential to the trio format. He is really the Compleat Percussionist, using to the full his elaborate arrangement of drums, toms, gongs, gourds, chimes and popes. On Xanadu, a Tibetan-based mood rocker, his foray into Oriental percussion was a logical extension of the piece, completely free of artifice. The crowd dug the tendrills-become-clouds of his Himalayan mist which poured forth at this point, courtesy of your friendly local dry ice dealer. Lakeside Park from the current album was a ballad, albeit up-tempo which would h[a]ve been great in a good hall or a private home. Catch it on your stereo for proper effect. Once again, Peart engendered a glow in my cynical old heart as he used cymbals for punctuation and appropriate emphasis rather than a high-had ride. 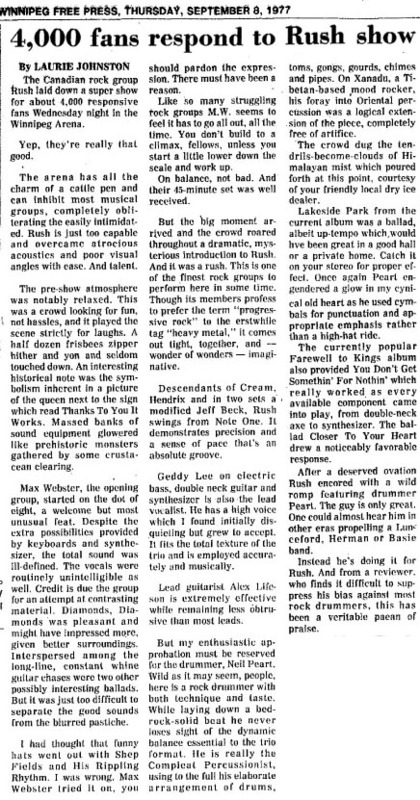 The currently popular Farewell to Kings album also provided You Don't Get Somethin' For Nothin' which really worked as every available component came into play, from double-neck axe to synthesizer. The ballad Closer To Your Heart drew a noticeably favourable response. After a deserved ovation Rush encored with a wild romp featuring drummer Peart. The guy is only great. One could almost hear him in other eras propelling a Lunceford, Herman or Basie band. Instead he's doing it for Rush. And from a reviewer who finds it difficult to suppress his bias against most rock drummers, this has been a veritable paean of praise.